Does anyone know if Tameside Mill #3 in Dukinfield, built by my Chadwick family, still stands? The company, John Chadwick & Co., was wound up in 1937, and I believe the other mill buildings were eventually demolished, but not Tameside building #3. Sorry I don't have an exact address for it. List of mills in Dukky here but can't see a #3. Notes: Built by the Chadwick family in 1852. The main block was six storeys. It was extended in 1857, 1860 and 1872 over doubling in size in 1884 it ran 102,000 spindles for spinning and doubling. In 1884 Potts Son and Pickup built the four-storey building known as No. 3 Mill by 1920 they were 115,596 mule spindles, 14,108 ring and 10,240 doubling spindles. This large enterprise closed in 1933, and all the buildings other than the No.3 mill were demolished. The map reference puts the location close to the River Tame off Whitelands Road close to the (now) Stagecoach depot. Thank you, Kiwi and Kennetho, for your responses. Some time ago I read an account of the Chadwick mill in Ian Haynes' book, The Dukinfield Cotton mills, published in 1993, which included a map of all the mills in the area. 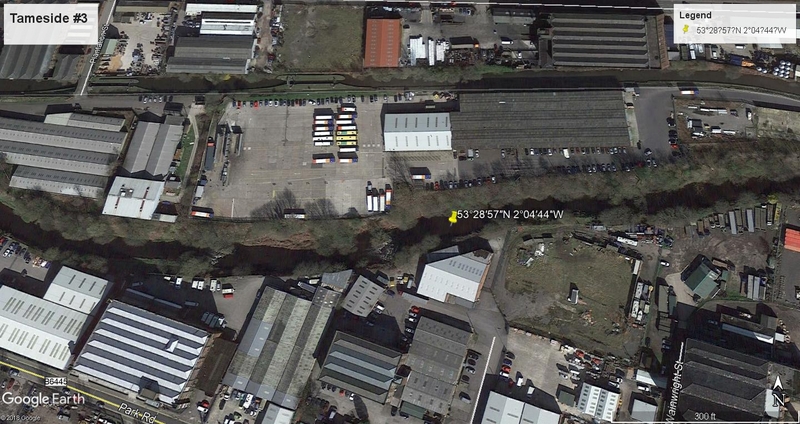 I've been comparing that map with the Google Earth view that you sent, Kiwi, and can locate area of the the Chadwick mill, between Park Road and the River Tame. It's good to know #3 building still stands. I am surprised no one mentioned that the mill burnt down in March. Correct me if I'm wrong, but aren't we talking about two totally different buildings on two different sites here? The Ray Mill was/is, I believe, situated in Stalybridge. My mistake, You are right. They were close though. Ray mill was on the other side of the river between it and the canal, next to the bus depot.